The Ireland-US Council presented its 2015 Award for Outstanding Achievement to Siobhán Talbot, Managing Director of Glanbia, in recognition of her leadership of Glanbia’s significant contribution to enhancing the economic relationship between the United States and Ireland. The award was the centrepiece of the Council’s 53rd Annual Dinner in New York City on 12th November last. The Ireland-US Council, founded by business leaders in the US and in Ireland in 1962, is now the premier transatlantic business organisation that encourages and promotes business between Ireland and the United States. Her remarks emphasised the significances of the behind the scenes efforts of people on both sides of the Atlantic to instil the sense of opportunity, particularly in young people, where she cited the Council’s Scholarship programmes role in building new leaders. 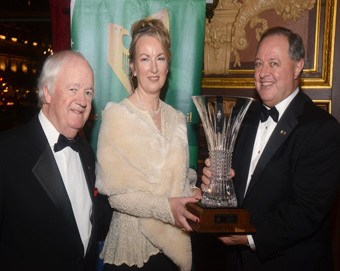 Pictured (l-r): Brian Stack, President of the Ireland-US Council; Siobhan Talbot; and Donard Gaynor (Non-Executive Director of Glanbia and Dinner Chairman).